ashmir, the paradise on earth, was discovered by the great Sage Kashyap Rishi in the hoary antiquity. There is an acceptable myth about its coming into present shape, some ten thousand years back. They say that it was a gigantic lake which was drained by the great Sage after he dismantled the narrow pass in the northwest and made a channel to drain the standing water. How far this myth is true, is left for believers to accept and rationalists to leave it to the researchers to find out the truth. The present name Kashmir is derived from the original name “Kashyap Var” meaning “the garden of Kashyap”. It was entirely inhabited by Kashmiri Hindus and ruled by Hindu rulers till AD 1339 when Shah Mir, a brute ascended the throne after defeating then ruler Kota Rani. It was Kashmir’s bad luck that the Hindu rulers were not capable which resulted in the throne being snatched by Muslims. Under the tyrannical rule of Muslim kings, Hindus were driven out of the valley multiple times after facing “die or convert to Islam” directives. Zainul Abedin (better known as Badshah) was an exception. He was perhaps the best known ruler to rule Kashmir and allow the two faiths to propagate their religions. In this connection, a reference may be made to the English translation of “Baharistan-i- Shahi” by Dr. K.N. Pandita, an ememinent Professor of Persian language in India. Kashmir has a rich cultural past so much so that one of the sources of Indian History, Raj Tarangini (River of Kings) was written by Pandit Kalhana, a learened Kashmiri Pandit and a great scholar of his time. It is a good read for anyone who is interested to understand Kashmir’s history over centuries. Out of numerous festivals celebrated by Kashmiri Hindus or Pandits as they are known, the most popular festival is Heirat or Mahashivratri. Even after the tragic forced exodus of Hindus from the beautiful valley from 1990 onwards, under the threat of Pakistan sponsored terrorism, Heirat is celebrated with enthusiasm, faith, fervour and traditional rituals. The worship of Lord Shiva and Devi Parvati is performed by the Pandits wherever they are throughout the World in traditional manner established by our forefathers. No other festival is celebrated in such a manner and scale by Kashmiri Pandits. The night of Shiva, the Eternal Lord – One among the TRINITY. The night when Lord Shiva bestows his favours to the mankind and provides them a chance to redeem themselves for immersion with the Divine. The night on which Lord Shiva was married to Devi Parvati or Jagatambha. After the Creation was completed, Lord Shiva told his consort Devi Parvati that the 13th/14th day of the dark half of the month of Falgun (Feb/March) was his most favourite day. Those who fasted and worshipped “Him” on that day pleased “Him” the most. The faithful and devotees in Kashmir would fill the “Kalash” with walnuts and worship the Lord by chanting “Om Namaha Shivay” and “Shiv Mahima Stotram” by Pushpadanta. The Shivlangam would be worshipped throughout the night by washing it with milk, yogurt, honey and rose water. Offering of flowers and bel leaves is part of the tradition. Bel leaves are considered to be very sacred according to Hindu philosophy. Hymns composed by great sage of 6th century AD Sri Sri Shankaracharya are chanted all along to get the divine blessings of Lord Shiva, one among the Trinity, Tridev. Tridev is actually manifestation of one God in three forms. The festival is celebrated with enthusiasm, full faith and gaiety. New clothes are worn on this auspicious day. All members of the Pandit family come back to their respective homes to celebrate this festival of festivals together with the loved ones. This was one of the reasons for the joint family system succeeding for a long time among Pandits. After the worship of the “Kalash” and the “Longam” for 3-4 days, the prasadam is sent to all the relatives, friends and neighbours. Heirat is a festival of joy and pleasure. It marks the end of winter in Kashmir as soon the spring season sets in. It is a belief that on this day, there would be snowfall in Kashmir. There is a saying that a tyrant King asked his subjects to celebrate the festival in the month of June to disprove this belief. But Alas! There was snowfall and the whole valley was capped with white blanket. The crops and fruits were deprived as a result of snowfall that year. Ultimately the Hindus were allowed to celebrate Heirat as usual in the dark half of Falgun (Feb/March). Shivratri is a process of moving towards Self Realization. Evil tendencies are to be curbed by controlling the mind and organs of knowledge & action. That is why devotees observe a total fast on this auspicious day. The chanting of mantras and burning of incense sticks and other material makes the atmosphere harmonious and congenial for the holy purpose. Group meditation is observed by the aspirant devotees under the supervision of the head of the family or a learned person in shastras. Bel patra represent the three important nadies (nerves), namely, Ida, Pingla and Sushumana. Joining of these three nadies cleanses the brahma nadi of all the sins and opens the passage for the vital force, the Kundalini to reach the Ajna Chakra. The Ajna chakra is positioned at the eyebrow region and has two white petals, said to represent the psychic channels, Ida and Pingala, which meet here with the central Sushumna nadi before rising to the crown chakra, Sahasrara. The vital air helps it to be seated with Shiva in the Sahasrara (the thousand petal plexus). This is known as marriage of Shiva with Parvati. The divine blessing that accrues from it is the realization of the Self by gaining omniscience which marks the end of circle of life and death. These white petals also represent the manifest and unmanifest mind, as well as the pineal and pituitary glands. 'Ham' is the letter of the left petal, and 'ksham' is the letter of the right petal, representing Shiva and Shakti, respectively. "Pranava Om", the supreme sound, is the bij, or seed mantra of this chakra. Ajna is considered the chakra of the mind. When something is seen in the mind's eye, or in a dream, it is being 'seen' by Ajna. Residing in the chakra is the deity Ardhanarishvara a hermaphrodite form of Shiva-Shakti, symbolising the primordial duality of subject and object, and the deity Hakini Shakti is also present in this chakra. In kundalini yoga, different practices are said to stimulate the Ajna chakra, including Trataka (steady gazing), Shambhavi Mudra (gazing at the space between the eyebrows), and some forms of Pranayama (breath exercises). Ajna is said to contain Mantrika shakti. Omniscience is the capacity to know everything infinitely, or at least everything that can be known about a character including thoughts, feelings, life and the universe, etc. In Hinduism, God is referred to as sarv-gyaata (omniscient), sarv-samarth (omnipotent) and sarv-vyapt (omnipresent) gyaata (knowing). Washing of the Lingam by yogurt, honey and rose water stands for conquest over desires, lust, anger and entire cleansing of the nadi chakra. This is the reason that it is known as Shubhratri also as it bestows divine grace and gnosis. 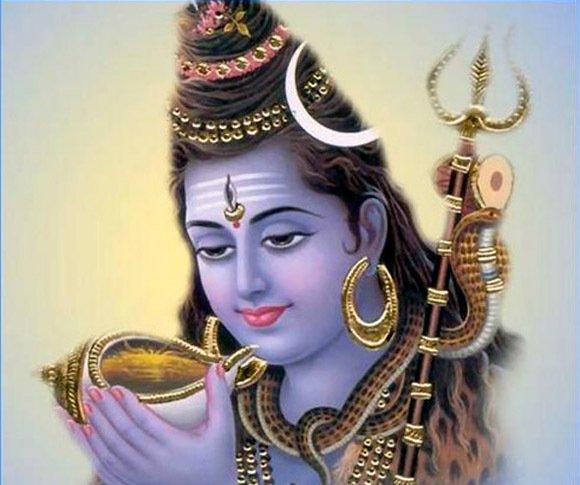 May Lord Shiva bless us all.